It’s a different Cavs team this morning. Last night, after several days of heated speculation, the Wine and Gold signed Andrew Bynum to a two-year contract potentially worth $24.5 million. 1. The Horseshoe Casino is no longer the only Dan Gilbert property where you can find gambling. Make no mistake: signing Bynum is a gamble. It’s the definition of a high risk/high reward move. If he’s healthy, Bynum is one of the best centers in the game; he averaged almost 19 points and 12 rebounds per game in his last full season with the Lakers. However, that “if” veers perilously close to aunt/balls/uncle territory. Bynum is never healthy. His knees will keep any number of surgeons, physical therapists, and trainers employed for some time to come. Of course, he missed all of last season with Philadelphia; Sixers fans are only too happy to put the Bynum chapter of the team behind them. Even before missing all of last season, Bynum had played only about 70% of the regular season games throughout his career. 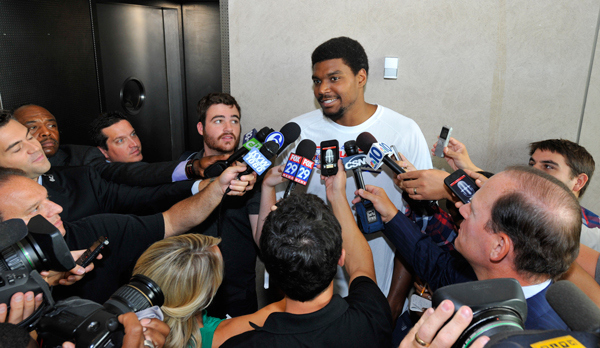 Going in, we know that Bynum is not going to play all 82 games this season; 50-60 is a more reasonable assumption. It’s quite likely that Bynum may not even play at all, if his drama from last season extends into this one. (Given the number of bowling alleys in the Cleveland area, it’s a legitimate concern.) Of course, that’s why the Cavs even had a chance at signing a talent like Bynum. If he were perfectly healthy, he’d still be in Philadelphia (or perhaps even Los Angeles). Signing Bynum is a gamble, but a reasonable one. 2. If Mike Brown had hair, he’d be about to lose it. Bynum is not only injury-prone; he also has a, well, creative approach to the game. The occasional three-pointer from the top of the arc. The stupid flagrant fouls here and there. Setting back his rehab because of an injury allegedly sustained while bowling. Whispers that he can be a cancer in the locker room. Bynum definitely requires some handling. That said, let’s not forget that Bynum had his best season (2011-12) while playing for Brown. It is easy for us as fans to read some articles and jump to our own conclusions about what makes a player like Andrew Bynum tick. But if Bynum really were such a disruptive force on the team, and so difficult to coach, then why would the Cavs (and Brown) want him around? The point to take away (in this situation and in life): whenever somebody makes a decision that looks questionable (and maybe stupid), it could be because they are making a bad decision … or it could be because they know more than you do. But we can still expect that Brown will reach for the Excedrin at least a few times over the next year. 3. The Bynum contract is very friendly to the Cavs. Bynum is guaranteed $6 million. That’s it. That’s less than what the Cavs paid Luke Walton last season. In the worst-case scenario, the Cavs are out a few million dollars (and it’s not our money anyway). This is not a situation where the contract could be an anchor that drags the team down for several seasons. If Bynum isn’t healthy, or otherwise isn’t the player the Cavs are hoping he will be, he will be gone by this time next season. The interesting sub-plot is that $6 million guaranteed was the best that Bynum could do, even with two other teams (Atlanta and Dallas) chasing him. In the world of the new NBA collective bargaining agreement, an eight-figure misstep costs even more. It appears that teams are going to be ever more hesitant to overlook a player’s past warts and hand him a huge, guaranteed, multi-year deal. 4. Anderson Varejao can finally be returned to the super-sub role that he was born to play. The past three seasons, Varejao, who was a valuable bench player for the first few seasons of his career, has moved into the starting lineup, with a consequent increase in minutes played. All three years, Varejao has gotten hurt (he has played a grand total of 81 games over those three seasons). He tends to be much healthier when his minutes per game are in the 20s (it may be hard to believe, but he missed almost no playing time in 2006-07, 2008-09, and 2009-10). Bynum’s presence moves Varejao back to the bench, and likely cuts his minutes back to approximately 25 per game. These are good things. Varejao is very effective while he’s on the floor, and paring back his minutes makes it much more likely that he will be on the floor for many more games. But Bynum and Varejao are two of the most injury-prone players in the NBA. It doesn’t take too much imagination to see Bynum and Varejao in suits, while Thompson/Bennett/Zeller grab the minutes at the center and power forward positions. Zeller probably will struggle for playing time when everybody is healthy, but everybody won’t be. Not for all 82 games. 6. C.J. Miles is probably gone. With the Bynum signing, the Cavs now have roughly $57.5 million in salary commitments for 2013-14. (Bynum, Varejao, Thompson, Zeller, Clark, Kyrie Irving, Dion Waiters, Alonzo Gee, and Jarrett Jack all have guaranteed contracts; and draft picks Bennett, Sergey Karasev, and Carrick Felix will all be signed as well.) That leaves a little under $1.2 million of salary cap space (the cap for 2013-14 has been set at $58.679 million). Absent some other move, Miles, whose $2.25 million contract for 2013-14 is not guaranteed, will need to go. While many fans won’t shed many tears over losing Mas Fresco, it will be a loss if it happens. Miles overcame a horrendous start in 2012-13 to be a useful player. You can never have too many outside shooters, especially one who can hit more than 38% from three-point range. 7. The Cavs’ offseason is probably finished. As said above, the Cavs are already near the salary cap. They’ve signed three notable-to-major free agents. They don’t have room to make any other moves, outside of “bringing Kevin Jones back for another season” or “signing a minimum-salary type guy to fill out the roster.” The roster appears to be set. 8. The Era of the Tank is definitely finished. It is finally time to write the epitaph for the Great Cavalier Tank of the 2010s. When LeBron James took his talents to South Beach three years ago, the Cavs chose to rebuild the team from the ground up, instead of signing some free agents in hopes of becoming the Milwaukee Bucks playing .500 ball. How do you rebuild from the ground up? With high draft picks. How do you lose a lot? By consciously putting an awful team on the floor. It is a concept that we will explore in more detail some other time. For now, let’s agree that the Cavs have been tanking the past three seasons. Yes, they could have won more games by signing additional players, but they knew that those wins would lead to lower draft picks, which would mean missing out on top-of-the-draft talent – the kind that really turns teams around. We could already see that the tanking was over earlier this offseason, when the Cavs signed Clark and Jack. The Bynum signing eliminates whatever tiny bit of doubt remained; the days of putting a sub-standard team on the floor are over. A side point: because the new CBA puts such a premium on cheaper talent, it is becoming more difficult for teams to swing trades for first-round picks, because the value of those picks has gone way up. Consider: in February 2011, the Cavs essentially paid $12 million to the Clippers for the rights to the Clips’ first-round pick in the 2011 draft. (The $12 million figure comes from the difference of the salaries of the players involved in that trade, in which the Cavs shipped Mo Williams and Jamario Moon westward and received Baron Davis.) It was known that the pick was going to be a lottery pick, probably high in the lottery (although nobody saw it morphing into the #1 overall pick, as it turned out). Now, we have Utah taking on $24 million of salary for two picks (via the trade with Golden State and Denver), at least one of which (the 2014 pick) figures to be in the 20s. (The other pick, in 2017, could turn out to be more valuable; a lot can happen in three years.) We also are a few months removed from a trading deadline in which only one future first-round pick was dealt, compared to previous years in which many picks would change hands. The Cavs were fortunate to trade for a total of six first-round picks during their rebuilding process; it’s unlikely that, if they were rebuilding from scratch today, that they would be able to get the same haul for the same price. 9. The Cavs should be better in 2013-14. A LOT better. The Cavs were 24-58 in 2012-13. 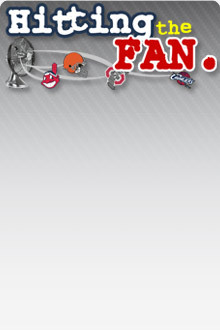 I am predicting, right now, that they will win at least 50 games in 2013-14. It’s not just because of Bynum (although if he is healthy, it will help the cause immensely). It’s because the roster has been greatly improved. Consider these numbers: 2541, 919, 857, 503, 447, 257, 196. Instead, those minutes will go to better players. Bynum, if he’s healthy. Varejao, if he can come back from his health issues. Irving and Waiters, if they can avoid the injury bug as well. Clark. Jack. Bennett. The Cavs’ problems last year did not stem from their starting lineup; they often charged to early leads. The problem usually arose when the starters had to sit, and some combination of Walton/Gibson/Casspi/etc. were on the floor. That’s not going to be the case in 2013-14. And it will make all the difference in the standings. 50 wins. I’ve called it and I am sticking by it. 10. The message has been sent loud and clear to LeBron James: the Cavs are committed to winning. It’s a mistake to say (as some pundits have) that the Cavs are banking on James returning as a free agent next offseason. As the saying goes, hope is not a business model; Gilbert is far too savvy to make the mistake of pinning his entire franchise on one player. (Uh, I should say that he’s far too savvy to make that mistake again.) LeBron has just won back-to-back titles in Miami, and the Heat figure to be in the title hunt in 2013-14. Would LeBron really leave if he leads Miami to a third consecutive title? So it’s naïve to say that the Cavs have been planning all along to bring LeBron back. However, they have built the team so that it is a possibility. With Bynum, they have now made the most significant free agent signing in team history. (Yes, even above Larry Hughes. I’ll pause here so you can all throw up in your mouths a bit.) The Cavs are showing that they can be players, and can attract top talent to Cleveland. Signing James next year is probably a longshot; but a core of Irving, Waiters, Bennett, and now Bynum would be hard to turn down, if James’ goal is to win several more titles. The bottom line? It’s impossible to over-state how important the Bynum signing is for the Cavs. For some time, the Cavs have been aiming toward a far-off future, when wins and capacity crowds and basketball in May (and June) returned to Cleveland. That future is now much closer to becoming the present.